How to convert and transfer Blu-ray to iPhone X? Do you want to enjoy Blu-ray movies on iPhone X? Here you will find the easiest way to rip and convert Blu-ray to iPhone X compatible videos so that you can enjoy your favorite Blu-ray movies on iPhone X with ease. 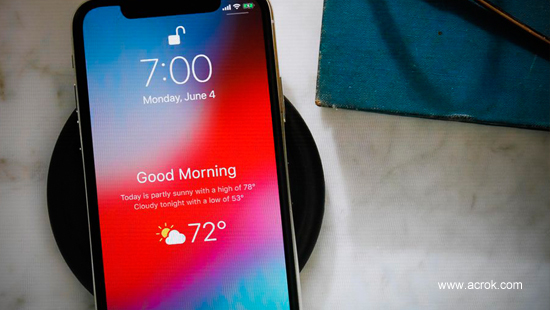 The iPhone X delivers a great blend of handheld comfort and a big, gorgeous 5.8-inch OLED screen. The rear-facing telephoto camera outshoots the iPhone 8 Plus in low light, and the front-facing camera snaps impressive portrait mode selfies. Face ID generally works fine. However, Apple has dropped the Blu-ray playback capacity on IOS device and iPhone X doesn’t have a built in Blu-ray drive, so it’s a bit complex to play Blu-ray movies on iPhone X. Don’t worry, in this tutorial I will share an effective way to walk you through how to play Blu-ray on iPhone X on the go. To play Blu-ray on iPhone X, you can rip your Blu-ray to iPhone X compatible video format like H.264 MP4 for playback without hassle. To rip Blu-ray to H.264 MP4, Acrok Blu-ray Ripper for Windows / Mac works as good as a handy Swiss knife. With it you can rip any (protected) Blu-ray to iPhone X compatible H.264 MP4 in high quality and fast speed. Besides, the perfect Blu-ray ripper also has the ability to rip Blu-ray to Galaxy Note 9, Galaxy S9 Plus, Huwawei P20 Pro, iPhone X, LG V30, OnePlus 6, Moto G6, Galaxy S9, Oppo Find X, Nokia 9, Moto Z3, Vivo Nex, Google Pixel 3 XL and many other devices you like. Tip: Fed up with being restricted to play your video files on Android devices due to the DRM copy protection? Now it’s time to free your video library. With M4VGO, you can legally bypass digital copyright protection from iTunes videos. 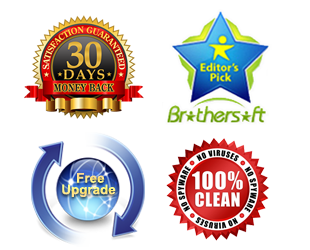 After that, you can play your video anywhere you like without any hassle. You can get this iTunes to Android Converter via 25% Off Coupon Code. You can finish your task in the following three simple steps. Note that the below guide uses Blu-ray Ripper for Windows (Windows 10 compatible) screenshots. The way to convert Blu-ray to iPhone X on Mac is the same. Just make sure you get the right version. Install and run the Blu-ray ripper on your PC, click the “Load Disc” button to add the Blu-ray movies to the software. 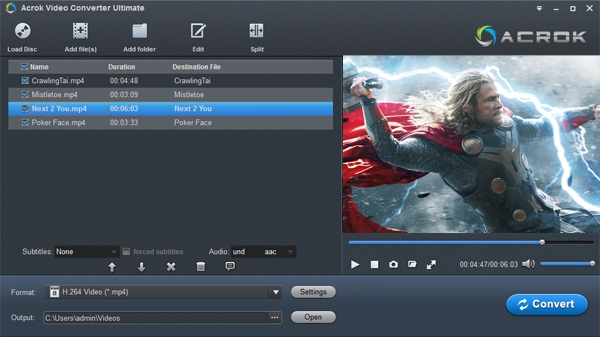 You can select your desired “Subtitles” and “Audio tracks” for the output Blu-ray movies. 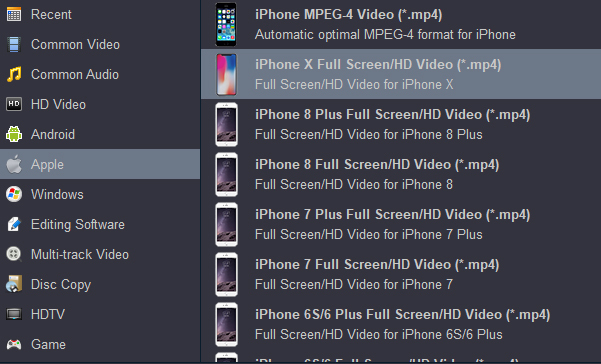 Press “Format” bar and find “Apple” column, pick up ” iPhon X Full Screen/HD Video (*.mp4) ” as your output. Tip: You can also click “Settings” to adjust the video resolution, frame rate, encoder, etc. to the output movies. If you want to play Blu-ray movies on other Android or Windows device, you need to rip Blu-ray to H.264 MP4 via Acrok program. With all settings, click Convert on the main interface to rip your Blu-ray to iPhone X compatible H.264 MP4 video. Once the conversion is finished, click “Open” button to locate the ripped videos. Then you can effortless transfer the converted Blu-ray movies to iPhone X for playback on the go, enjoy! How to watch DVD on iPhone 5S with Subtitle?